Ruth Amiran with N. Avigad on the left and Y. Yadin on the right. Born in 1914 at Yavne'el, Israel, Ruth Amiran's father, Yehezkel Brandsteter, had immigrated to Palestine from Tarnow, Galicia in 1908. Initially he was employed as a construction worker for a few months in Haifa, in what would later become the Technion (Israel Institute of Technology). Thereafter he went on to the Mashavot in the Galilee. Settling in Yavne'el (south of Tiberias) in 1910, he completed establishing their household, and Amiranï¿½s mother, Devora, joined him in 1913. 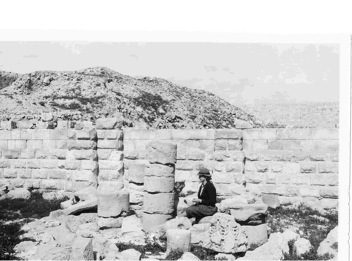 Ruth Amiranï¿½s interest in archaeology, which predated her move to Haifa, in 1928, was developed on walks from her home to the mound of Yenoam, located in the fields of Yavne'el. On her visits to the tel she collected pottery sherds, which she would spread out in the back yard. She would intensely scrutinize them looking for similarities and differences between them. Amiran moved to Haifa in 1928 and enrolled in the Hebrew University of Jerusalem in 1933 and received a Master's degree in 1939. Her thesis, "The Pottery of Grar," supervised by Professor Eleazer Lipa Sukenik, was an analysis of the pottery of Tel Jemmeh (10 km south of Gaza). In 1934-1935 she participated in the excavation of Et-Tell/Ai, (20 km north of Jerusalem) directed by Judith Marquet-Krause. After graduation Amiran worked in the Department of Archaeology at the Hebrew University of Jerusalem, and at The Palestine Archaeology Museum, (PAM, also known as Rockefeller Museum (then a part of Palestine and the British Mandate Department of Antiquities). With the end of the British Mandate, Amiran was employed by the State of Israel's Department of Antiquities. At this time she organized the infrastructure for Israelï¿½s regional museums. These museums were a central depository for the artifacts of the many excavations held in the various regions, for here they would be displayed. These museum collections were augmented by substantial numbers of artifacts held in private collections, mainly in the Kibbutzim. Amiran organized these private collections together with the excavated artifacts and transformed them into organized regional museum displays and storage. 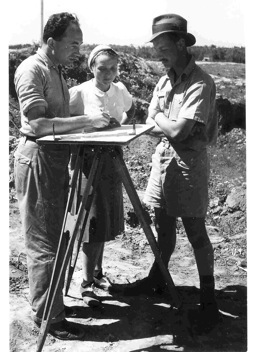 Between the years 1955-1959 Amiran took part in the Hazor Expedition (directed by Yigael Yadin of the Hebrew University) as director of Area B, and she oversaw the processing of the ceramic finds from the excavation. During these years, she laid the foundations for the study for her 1969 pivotal magnum opus, the "Ancient Pottery of the Holy Land: From Its Beginnings in the Neolithic Period to the End of the Iron Age " (Ramat Gan: Massada Press). In the early 60s Amiran began working as an excavator-researcher in the Israel Museum, where she spearheaded the foundation of an official, active Excavation Department. 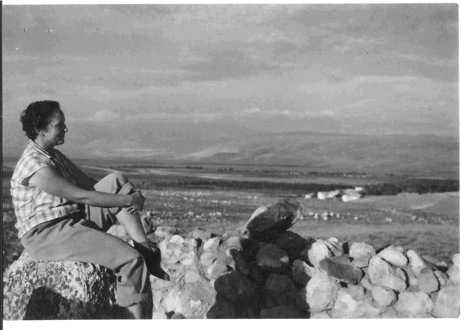 In 1962-1963 she directed several excavations, among them Tel Nagila, (28 km east of modern-day Gaza, on behalf of the Institute for Mediterranean Studies in Jerusalem, (now defunct), which she co-directed with Avi Eitan). She also excavated with Carmela Arnon from 1976 to 1983, at Tel Kishion (10 km north-east of Afula), sponsored by the Israel Museum and Israel's Department of Antiquities. From 1962 until 1984, Amiran directed the excavations at the Canaanite city of Arad. During 18 seasons, the archaeologists exposed a sizeable Canaanite city of some 25 acres. These excavations indicated that Arad exhibited sophisticated urban planning; the city was divided into quarters, each with a specific function: the west was reserved for the temple complex and residential areas were located in the south. Arad also showed that the city was surrounded by a fortified wall, some 1200 m in length and 2.4 m in width, with two gates and two posterns. Along the inside of the wall was a main ring road, and the city was planned with a network of streets. From the gates, cross streets extended into a topographic depression in the city's center. Here drained rainwater flowed into a large reservoir, thus guaranteeing a continued water supply during the long rainless summers. Ruth Amiran married a geographer, Professor David Amiran; they were childless. Amiranï¿½s main field of study focus was the ancient pottery of the land of Israel. Her articles reflect a multi-disciplinary approach to ceramic analysis of pottery. Ceramics were artifacts created by humankind since the Neolithic period, and she became the authority on the historic development of the potter's art, including methods of manufacture, pottery's chronological and typological aspects and the distinctive ceramic horizon markers of each period, as well as interest in the potter's status in ancient society. She was also concerned with functional analysis and the artistic and religious uses of pottery. In her view, the ceramic vessel was "a valuable artifact by itself, as a product expressing the technical and artistic achievements of its period." Ruth Amiran died in December 2005. But her contribution is a reflection of the archaeology of Israel, from its very early days to the early 1980s. Her enormous contribution and legacy, the study of the ancient pottery in the land of Israel, was to prove invaluable for Israeli archaeological research. Amiran (Brandsteter), R., The Pottery of Grar (MA Thesis), the Hebrew University, Jerusalem 1939. (Hebrew). Amiran (Kallner B. ), R., 'Khirbet Kerak Ware and its Relation to the EB Tomb Discovered at Kinneret', Yediot 10 (1943), pp. 63-65. (Hebrew). Amiran (Kallner B. ), R. and Vroman, J., 'Petrographical Examination of Pottery', Yediot 12 (1946), pp. 10-15. (Hebrew). Amiran, R., 'Connections between Anatolia and Palestine in the Early Bronze Age', Israel Exploration Journal, 2 (1951), pp. 89-103. Amiran, R., "Ceramic Vessels and Their Value for History," Remains of the Past, An Anthology on the Study of the Land and its Antiquities, Tel Aviv 1951, pp. 21-32 (Hebrew). Amiran, R., 'The Tumuli West of Jerusalem', Israel Exploration Journal, 3 (1953), p. 264. Amiran, R., 'Excavations in the Tumuli West of Jerusalem', Proceedings 23rd International Congress of Orientalists, Cambridge 1954, pp. 144-145. Amiran, R., 'The 'Cream Ware' of Gezer and the Beersheba Late Chalcolithic', Israel Exploration Journal, 5 (1955), pp. 240-245. Amiran, R., 'The Tumuli West of Jerusalem: Survey and Excavations', Israel Exploration Journal, 8 (1958), pp. 205-227. Amiran, R., 'The Pottery of Middle Bronze Age I in Palestine', Israel Exploration Journal, 10 (1960), pp. 204-225. Amiran, R., 'The Beginning of Pottery-Making in the Near East', in: Matson, F.R. (ed. ), Ceramics and man, Chicago 1965, pp. 240-247. Amiran, R., 'Khirbet Kerak Ware at Ai', Israel Exploration Journal, 17 (1967), pp. 185-186. Amiran, R., Ancient Pottery of the Holy Land: from its Beginnings in the Neolithic Period to the End of the Iron Age (with P. Beck and U. Zevulun), Ramat Gan 1969. Amiran, R., 'The Beginnings of Urbanization in Canaan', in: Sanders, J.A. (Editor), Near Eastern Archaeology in the Twentieth Century, New-York 1970, pp. 83-100. Amiran, R., 'A Cult Stele from Arad', Israel Exploration Journal, 22 (1972), pp. 86-88. Amiran, R., 'Reflections on the Identification of the Deity at the Early Bronze II and Early Bronze III Temples at ï¿½Ai', Bulletin of the American School of Oriental Research, 208 (1972), pp. 9-13. Amiran, R., 'The interrelationship between Arad and sites in southern Sinai in the Early Bronze Age II (preliminary report)', Israel Exploration Journal, 23 (1973), pp. 193-197. Amiran, R., 'An Egyptian Jar Fragment with the Name of Narmer from Arad', Israel Exploration Journal, 24 (1974), pp. 4-12. Amiran, R., 'The Lion Statue and the Libation Tray from Tell Beit Mirsim', Bulletin of the American School of Oriental Research, 222 (1976), pp. 29-40. Amiran, R. and Aharoni, Y., 'A New Scheme for the Sub-Division of the Iron Age in Palestine', Israel Exploration Journal, 8 (1958). pp. 171-184. Amiran, R. and Arnon C., 'Small Tel Malhata', Israel Exploration Journal, 29 (1979), pp. 255-256. Amiran, R. and Cohen, C., 'Tel Qishyon', Israel Exploration Journal, 27 (1977), pp. 164-165. Amiran, R. and Eitan, A., 'A Krater of Bichrome Ware from Tel Nagila', Israel Exploration Journal, 14 (1964), pp. 219-231. Amiran, R. and Eitan, A., 'A Canaanite-Hyksos City at Tell Nagila' Archaeology, 18 (1965), pp. 113-123. Amiran, R. and Eitan, A.,'Nagila, Tel', The New Encyclopedia of Archaeological Excavations in the Holy Land, Vol. 3. Jerusalem 1993, pp. 1079-1081. Amiran, R. and Ilan, O., Early Arad: the Chalcolithic and Early Bronze IB Settlements and the Early Bronze City, Architecture and Town Planning, Vol. II. Sixth to Eighteenth Seasons of Excavations, 1971-1978, 1980-1984, Jerusalem 1996. Amiran, R., Paran, U, Shiloh, Y, Brown, R. Tsafrir, Y. and Ben-Tor, A., Early Arad: the Chalcolitic Settlement and Early Bronze City, Vol. I. Jerusalem 1978. Arnon, C. and Amiran, R., 'Kishion, Tel', The New Encyclopedia of Archaeological Excavations in the Holy Land, Vol. 3. Jerusalem 1993, pp. 873-874.